It has been a dominant, high-scoring season for the St. Paul football team. Entering the 1A postseason, the No. 3 seed Buckaroos were averaging nearly 65 points per game. On Friday at St. Paul Rodeo Arena, they narrowly eclipsed their average in a 66-30 thrashing of No. 14 seed Elgin. The Bucks led 58-0 at the half, and that lead lasted until the midway point of the third quarter, when their reserves allowed Elgin to score a touchdown and two-point conversion. 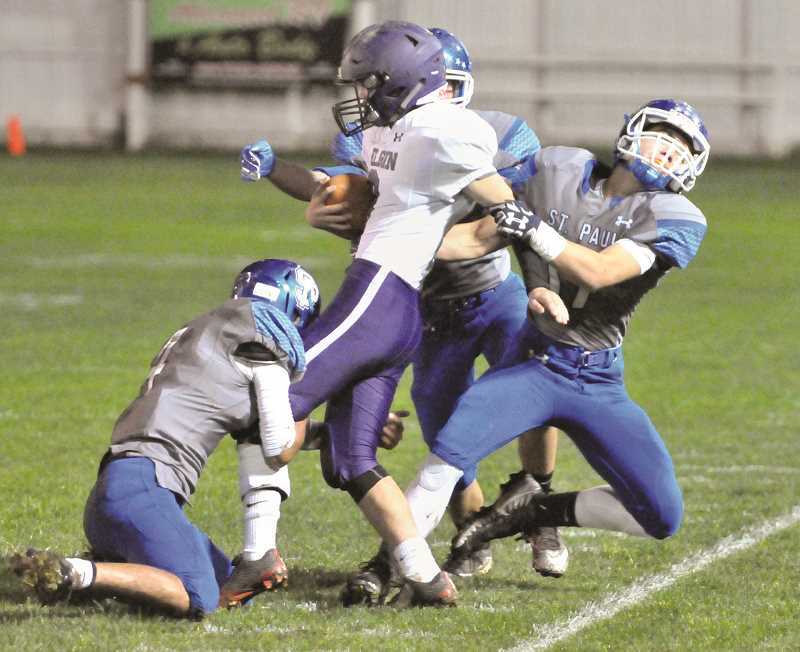 When the St. Paul starters were on the field, however, the Bucks were seemingly unstoppable. Quarterback TJ Crawford finished 10 of 12 for 183 yards and three touchdowns through the air, along with 105 yards and two touchdowns on the ground. One of Crawford's rushing touchdowns accounted for 91 of his rushing yards. "I thought we played well offensively in terms of execution," St. Paul coach Tony Smith said. "We were able to throw and run the ball effectively, and that's a goal for us going into every game. I thought (Crawford) had his best game of the season." After one quarter, the Bucks led 28-0 thanks to Crawford's pair of rushing touchdowns, along with a receiving and rushing touchdown by running back Justin Herberger. The playmaking ability of the duo was on display all night, as Herberger finished with 139 rushing yards on five attempts. The second quarter opened with a 63-yard rushing touchdown by Saul Martinez. Just over two minutes later, Rawley Koch hauled in a 19-yard score. A 4-yard run by Francisco Vargas-Ayala and a 4-yard catch and run by Mitchell Curtis brought the game to its 58-0 halftime margin. With reserves in for much of the game's remainder, a 30-8 second half is less concerning for the Bucks (10-0) heading into a second round matchup with No. 6 seed Crane. If they keep scoring like this, they will be hard to stop in the state playoffs. "We have talented kids," Smith said. "It's always a goal of ours to run the ball effectively and throw a play action pass off of that. Any time you can establish the run against a team — and throw the ball also — that makes your offense much more dynamic." Despite a lackluster second half with reserves in the game, defense was a point of strength for the Bucks on Friday as well, according to Smith. "Defensively, we were able to take away many of the things they wanted to do," he said. "They had a really good wide receiver-quarterback combination, and they weren't able to complete a pass together." St. Paul's game against Crane is scheduled for 7 p.m. Friday at McMinnville Stadium. The Mustangs are 8-2 and have struggled down the stretch of their season, going 1-2 in their final regular season games after starting 6-0. Crane is coming off a 50-6 victory over North Douglas in the first round. This will be the first look at Crane since St. Paul's return to 1A. "They have, historically, been a very good football program," Smith said of the Mustangs. "I've been here since 2006 and we played them in the playoffs that year and multiple times after that. We're pretty familiar with the things that we do – they're going to run the football and play very aggressive defense."